Muscle tightness, a common “cause” of pain, is typically just a reflexive response as our body finds new ways to move in order to cheat around the real problem. Understanding fascial adhesions, or scar tissue, and its roll in performance and injury is extremely important and often overlooked. 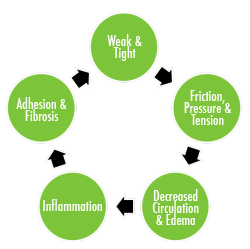 Fascial adhesions are tough, dense, and bind tissues together that need to slide freely. Lets first look at the 3 causes of fascial adhesions or scar tissue. When most people think of scar tissue, acute injuries are what come to mind. Ankle sprains, rotator cuff or MCL tears, and surgery will all lead to scar tissue formation and possibly future issues. Sports injuries typically fall into this category. Any repetitive motion whether it’s sport specific such as throwing a ball and running, or labor related such as raking and turning a wrench will cause minor trauma to the tissues. As the tissues heal a small amount of scar tissue will form. Performed regularly enough you’ll accumulate enough scar tissue to become a nagging pain at best or set you up for an acute injury. This is the most overlooked cause of muscle tightness. For tissues to stay healthy they need a constant supply of blood. Blood is what carries oxygen and nutrients to your tissues and takes away waste products. Think of your muscles like a sponge. As you squeeze and release, it draws water in and out of the sponge. Your muscles are designed to do the same thing as you move; drawing in fresh oxygen and nutrients and pushing out waste. Muscle Tightness is a big deal. Your body is a precision machine made up of multiple layers of muscle, each with its own action and line of pull to help you optimally perform tasks. But what would happen if you dripped a glob of glue (i.e. scar tissue) on a muscle? Lets look at a common example. Holly is your typical desk jockey / running fanatic. Like most, Holly spends the majority of her day at her desk hunched over a computer. The first step in fixing your problem is performing a Selective Functional Movement Assessment, or SFMA. Often times the root of your problem isn’t limited to one tissue. It’s usually a collection of issues in the region that all tend to feed each other. The SFMA helps us get a better idea of how wide spread your problem is so we don’t unintentionally narrow our search too much. Next we search for and treat specific fascial adhesions and joint restrictions that are causing your dysfunctional movement patterns, tightness, and pain. Fascial adhesions respond best to Active Release Technique and Graston Technique while joint restrictions would require a chiropractic adjustment or some form of joint mobilization. Active Release Technique and Graston Technique are both advanced systems of diagnosis and manual treatment for soft tissue problems resulting from sports injuries, postural strain, and general wear and tear.